Thes are images from a street painting festival I took part in last year. It is coming up again and I was asked to be in it this year. I want to recreate an entire comic page (word balloons and all) for my painting this year. I need advice. Alex Ross looked really nice and impressive last year (his style lent itself to the bigger than life size) and I would do one of his page layouts... but since I did DC last year I wanted to do Marvel this year, and most of his good stuff is the oversize "Peace on Earth/War on Crime" books. Can anyone suggest some pages that might work? Issue and artist... and if there is a link to it or an image to show that would be AWESOME (also, would like to keep the words to a minimum... small shapes don't hold up well on the rough pavement.) PLEASE PLEASE give me some advice on this. The festival is the 2nd week in June, but I have to turn in my concept in the next week or so. Thanks in advance, and enjoy the images. That looks like it was an insane amount of work. It looks great! And not that I needed any more confirmations on my geekdom, but I was thinking on the Galactus/Reed Richards nullifier scene not even an hour ago (and have no idea why). I agree with Dave; that would be classic. Thanks everyone so far. Good ideas. And thanks for moving this mike, wasn't sure where it should go, but your point is well taken and the lounge is the best bet. I ahve seen that guys stuff before. 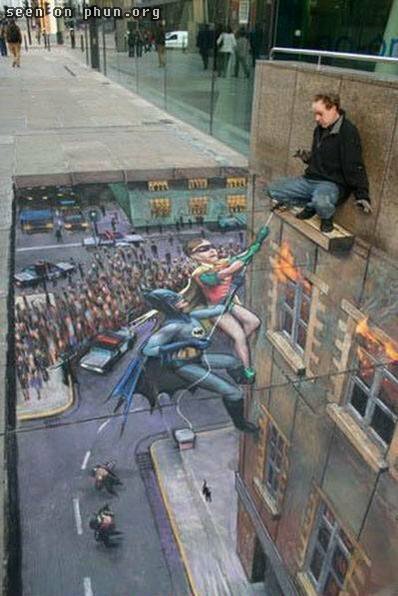 What he does is incredible... the optical illusions are amazing. Does ANYONE have any comic pages to suggest for my next street painting? I am going to do one whole page.